The Ninth Annual Kathina Ceremony was held on Sunday 18th November with a large gathering of Venerable Buddhist Monks and over 300 hundred devotees acompanied by distinguished guests. It was a great success with colourful ceremonial memories. We are very much greatful to all our members overwhelming support. The Ninth Consecutive Annual Kathina Ceremony of Letchworth Dhamma Nikethanaya Buddhist Cultural Centre was held on Sunday 18th November 2012 at the St Michael’s Church Hall in Letchworth. Over 300 devotees witnessed the glory of the typical tradition of the Kathina Ceremony in an extremely rare and happy presence of a large number of venerable Buddhist Monks and distinguished guests. The Annual Kathina Ceremony is the highly regarded special day for the local Buddhist Community to pay their gratitude to their Spiritual Teachers (Monks) for their valuable contributions towards the cohesion and well-being of the community. This Community Celebration is held after three months of Meditation Retreat, traditionally called Three Months Rainy Retreat (Vassana), particularly to bring all the local communities together in celebration of their spiritual progress. Everyone highly appreciated the well organised ceremony bringing many aspects of the early Buddhist culture and tradition to light in an inspiring manner for Buddhists as well as non-Buddhists. The ceremony organized under the guidance of Venerable Akurala Samitha, the head monk of the Dhamma Nikethanaya Buddhist Centre. Since its inception in 2004, Letchworth Dhamma Nikethanaya International Buddhist Cultural Centre for Education Meditation Psychotherapy and Counselling has been as a shining beacon for numerous needs in daily life in the diverse community, enriched with members from major nationalities like Sri Lankan, Indian, English, Myanmar, Chinese and others. Its Founder, Venerable Akurala Samitha is a professionally qualified senior Theravada Buddhist Monk originally from Sri Lanka. Friends of Dhamma Nikethanaya Buddhist Centre regard him as a gifted blessing with incomparable skills in communication, talents in illuminating hearts and minds with the noble teachings of the Buddha as well as secular meditations and therapeutic counselling, and also an embodiment of true compassion to work for the wellbeing of the community. 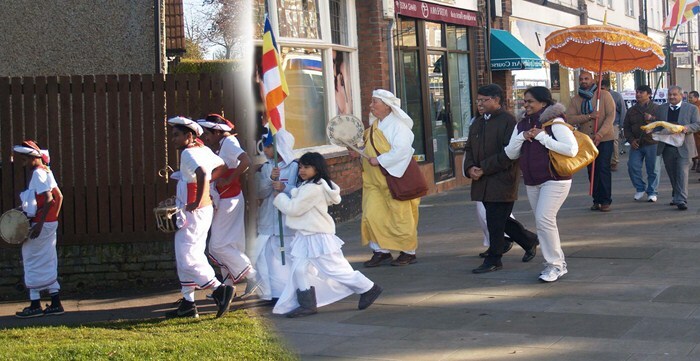 A Spectacular presence of over sixteen venerable monks from different parts of the country graced the ceremony by walking across the Letchworth Garden City town centre in a colourful procession with traditional drummers, Buddhist flags and other special objects of veneration. Attending the ceremony were Most Venerable Dr Handupelpola Mahinda Thera (Kingsbury Temple), Most Venerable Tawalama Bandula Thera, (Deputy head of London Buddhist Vihara), Most Venerable Manampitiye Amitha Thera (London Buddhist Vihara), Most Venerable Kalatuwawe Pangnasara Thera, (the chief incumbent of Dhathukanda Purana Viharaya), Most Ven Kahatthewela Chandajothie Maha Thera (Principal & Head of Kothmale Vidyaloka Maha Pirivena), Most Venerable Pulahastigama Dhammakusala Thera, Venerable Kariwilakotuwe Dhammathilaka Thera (representing Thames Buddhist Vihara), Venerable Waskaduwe Subodhi Thera, Venerable Napalese Tissa Thera (representing Kingsbury temple), Venerable Laung Poh Sudiro & Venerable Kemacitto (representing Buddha Metta Cambridge Tai Vihara), Venerable Ariyasilo and an anagarika (representing Amarawati Monastery Hemel Hempstead) and Venerable Sister Y Maruta representing Nipponzan Myohoji Peace Pagoda Milton Keynes. The graceful presence of the Sri Lankan High Commissioner in London H.E. Dr Chris Nonis accompanied by Mr H K M Herath & Dr Kokila Waidyaratne added light and devotion to the programme. Our community were immensely impressed with His Excellency’s humble gestures in community service, devotion and dedication of promoting Sri Lanka in a distinctive intellectual, fair and just international community spectrum. The Award winning diplomat deeply appreciated the outstanding contributions of Venerable Samitha, head of the centre and the Dhamma Nikethanaya Buddhist Centre, particularly in Meditation and Mental Health promotions. He highly commended the outreaching skills with distinction of Venerable Akurala Samitha, in his speech. This was evident in cosmopolitan gathering at the ceremony. His speech as usual was greatly received by the community. Mr Kenneth John represented Letchworth Garden City Heritage Foundation on behalf of Mr Alastair Stewart, Head of Charitable Projects and partnerships. Mr Madwala Hemananda delivered the Keynote Speech introducing his new book on “emptiness” and elaborated benefits and scientific facts of Meditation in day to day well-being and spiritual accomplishment. His impressive lecture enriched the programme very much. Venerable Kemacitta conducted the guided meditation. Ms Rebecca Phillips, a regular practitioner of meditation at the centre under the guidance of Venerable Akurala Samitha, explained with her life experiences, how meditation could be beneficially practised in a secular way. A group of Wolverhampton Panjabi Buddhist Musiciansentertained the gathering with an offering of two exceptionally beautiful devotional songs which was sung elegantly professional way. Children of Thames Buddhist Vihara paraded with the traditional drumming in elegant costumes. A member of the Centre, Mr Arun Raj added to the spirits of all by playing traditional Panjabi drums remarkably. Children of the Community paid special gratitude offering gifts to all the monks. Two Samadhi Buddha Statues were then offered to two families. Mr Des, Mrs Pushpa & Rajfamily were the principal sponsors of this year’s Kathina ceremony with full participation and generous support of all the members of the centre. 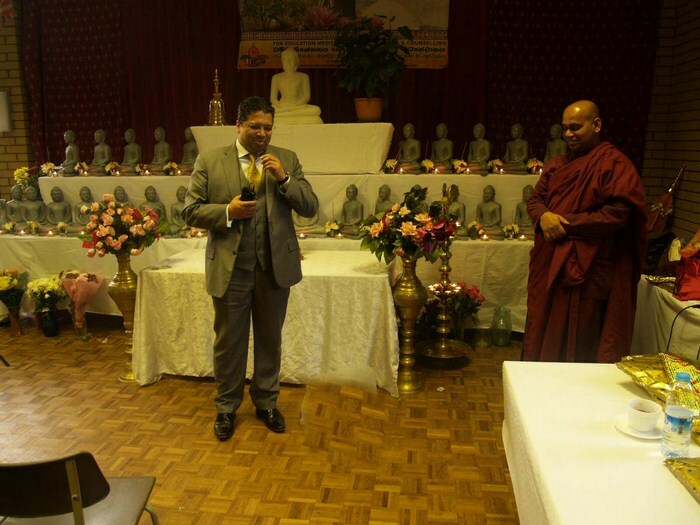 A Delegation of The Thames Buddhist Vihara headed by Dr Herath Kularathna (president) also attended the ceremony in honour of Ven Akurala Samitha's contribution towards the religious and social services of the Thames Buddhist Vihara. Conducting a brief Blessings Chanting Pooja for Twenty Eight Buddhas and Tribute Homage merits sharing with Parents, Venerable Akurala Samitha thanked everyone for their support in making the Ninth Annual Kathina Ceremony an enormous success, stating that without their generosity, compassion and goodwill of Friends of the Dhamma Nikethanaya Buddhist Centre nothing would have been possible. For more details please visit our website www.buddhistacademy.com. May the Blessings of this greatest meritorious deed completely fulfill, without exception the aspirations of all, and lead to the everlasting happiness Nibbana! May all be secure, well and happy with noble blessings of the Triple Gem!